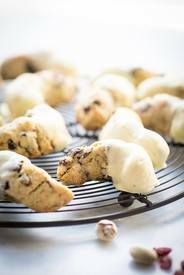 Yes, White Chocolate Dipped Pistachio Cranberry Crescent Cookies to be exact! One thing I love about wintertime is the cookie baking season. I bake a ton of cookies and every year I like making a cookie with white chocolate pistachios and cranberries in one form or another. Every year the cookie is different, and this years is my favorite so far, White Chocolate Dipped Pistachio Cranberry Crescent Cookies.